Synopsis: This second novel begins in 1940, immediately after the first book ended. Having escaped Miss Peregrine’s island by the skin of their teeth, Jacob and his new friends must journey to London, the peculiar capital of the world. Along the way, they encounter new allies, a menagerie of peculiar animals, and other unexpected surprises. This second book in the series did not disappoint me at all. Again, the pictures really make the book come alive and bring that extra touch. The storyline was fast-paced. Not too slow to get bored with the story, and not too fast to not follow the story anymore. There is enough adventure in the book to keep it interested. Also a lot of new things are happening. We meet some new peculiars, and learn more about the whole universe of peculiarism. 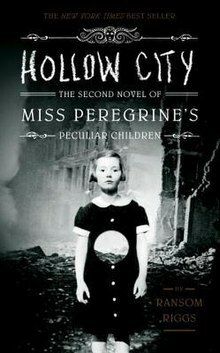 I got really attached to the group from miss Peregrine, and throughout the book you will see a lot of situations where the group has to work together, which leads to a stronger bond between everyone and shows the use of the peculiarities of the children. I love the fact that in the first book they didn’t really know what to do with the monsters and how they could defeat them, but in the second book they are really working together and more in a fight than flee mode. Everyone seems a lot more confident about what they are capable of with their peculiarities. One thing about the story that I would have loved to happen, is that I would see miss Peregrine again, and that she and the children would go on an adventure together. It will take a very long time before we see what happens with the bird. Besides that I think the story was a really well done sequel to the first book. The end of the book brings a lot of exciting things and I really want to read the third book to see what happens. I liked it more than the first book. This because a lot more was happening, we see different places and people, when in the first book we basically only saw the island and the same group of people.